Samsung is working on successors for its Galaxy Tab S 8.4 and Galaxy Tab S 10.5 tablets, as we've told you before. There will be two devices in the Tab S2 line too, but they will have different sizes - because Samsung has this time around opted to use 4:3 aspect ratios, favored by Apple for all of its iPads, and by Google recently for the Nexus 9. So far we've only known that the new Tab S devices would have Super AMOLED touchscreens just like their predecessors, and that they are going to be thinner than any iPad ever. Now though we have a pretty complete list of specs for the bigger, 9.7-inch Galaxy Tab S2. This is because someone testing such a device has decided to run a benchmark on it. And that benchmark stores information about the products that run it. So the bigger Tab S2 will sport a touchscreen with 2,048x1,536 resolution (like recent iPads and the Nexus 9), 3GB of RAM, 32GB of built-in storage, an 8MP rear camera, and a 2MP front snapper. 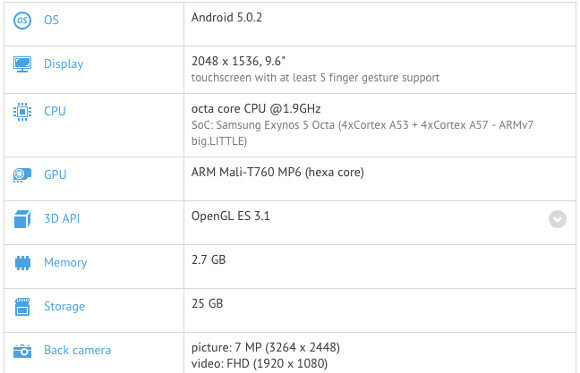 Ignore the 9.6" listing for screen size, as this particular benchmark can get that wrong sometimes. It also likes to underreport camera resolutions, which is why it says the rear unit in the Tab S2 is 7MP. As for RAM and storage, we assume it gives us free space. The Tab S2 runs Android 5.0.2 at the moment, and it's powered by one of Samsung's own Exynos chipsets, which has a big.LITTLE CPU configuration, with four Cortex-A57 cores and four Cortex-A53 ones. The maximum clock speed is 1.9 GHz. The GPU is a hexa-core Mali-T760MP6. So the SoC has been updated from the Exynos 5420 in the original Tab S tablets, which had older Cortex-A15 and Cortex-A7 cores. Meanwhile, the RAM amount has stayed the same, as have the cameras. The Galaxy Tab S2 9.7 will reportedly have a metal frame, and it's rumored to weigh just 407g, and come with the following dimensions: 237.1 x 168.8 x 5.4 mm. That would make it smaller than the iPad Air 2 in every respect, and lighter too. Right. I am not going to chase down the wife or kids just so I can change the channel. "Hey honey can you hurry up in the bathroom? Game of Thrones is on and I need the Sammy Tab!" "Sorry babe! I am playing my own game on the throne!" Oh yea? Turn the TV off with your iPad. Write notes in onenote while resting your palm on the screen. Measure depth with your camera. Oh you can't?... that's too bad.